ANN ARBOR, Mich., May 29, 2018 /PRNewswire/ -- Customers asked and Domino's delivered! Domino's (NYSE: DPZ), the largest pizza company in the world based on global retail sales, is now giving customers the chance to submit their own recommendations for Domino's Hotspot delivery locations across the U.S.
More than 150,000 Domino's Hotspots were launched in April, giving customers the option to receive deliveries at locations without traditional addresses – places like dog parks, beaches and sports fields. Now, Domino's is excited to add even more local delivery spots based on customers' feedback at dominos.com/suggestahotspot. "We heard from customers about places in their communities that would make perfect Domino's Hotspot locations," said Dennis Maloney, Domino's chief digital officer. "We're excited to now have a system for customers to share those locations with us, making our easy-to-use Domino's Hotspots even more relevant to our local neighborhoods." After customers visit dominos.com/suggestahotspot, they can identify a new location on the delivery map for their nearest store and then mark it as a potential Domino's Hotspot for the local franchisee to review. Once approved, customers will receive an email letting them know the location is ready to accept deliveries and the Domino's Hotspot will appear on the map for customers to select. 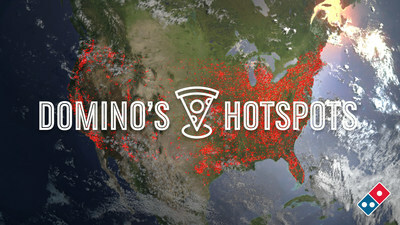 The option to suggest a Domino's Hotspot has launched in conjunction with new television ads, which feature a Domino's ambassador traveling from a dog park to a little league game, to a college quad and even delivering to a certain "big-footed" customer, making sure all the official "grand opening" ribbons are cut at new Domino's Hotspot locations. To see the new ads, go to youtube.com/dominos.